It was worth fighting for then. Have the times changed? If so, how? Is Free Speech still a workable liberty? Campus Free Speech: For Whom? The absurdity of Trumpland is truly comic were it not for the damage being inflicted upon the institution’s of our republic. This so called president and his so called national security advisor are an embarrassment. Have we ever seen so many serious self inflicted errors by a new administration? Pointing out the failures of an obviously flawed mission is an insult to the Kia Navy seal? Then what does Trump’s year’s long critique of Iraq make of the thousands of Kia and thousands of wounded in iraq? When do patriotic conservatives call BS on this garbage? David? You lack perspective. Obama’s appeasement strategy has failed us. It has led to a genocide against Christians in Iraq. I’m glad Trump has set us up to win again. Jcd – you dodged the question. Perhaps a thoughtful correspondent would note that Clinton’s gays in the military was a distracting imbroglio in its day. Perhaps the failure of health reform in 1994. But that took years to play out. Perhaps a thoughtful and less partisan commentator would note that the Iraq debacle was unleashed and mismanaged by a prior President. The status of forces agreement which established the parameters for the drawdown of us troops was also negotiated under that prior admin. A thoughtful commentator would note that public support for the occupation of Iraq had collapsed. Lastly, a thoughtful commentator would note the tremendous strain the Iraq occupation had placed on active duty and reserve forces of that time. And what pray tell has Herr Drumpf done to date to address the issue you raise? He has tweeted more about Ivanka’s norstrom clothing line than he has about the plight of Christians in Iraq. Same can be said about the dead from the mosque massacre in canada. Or the evolving stories from his national security advisor. I think you are not seeing the whole picture yet. If I was a Christian in Iraq, I’d feel a lot better about the chances of survival for myself and family under the Trump administration. He is already seeking to make it easier for Christian refugees to come to the U.S.
President Trump has also been condemned for signaling he will give priority to persecuted religious minorities in the Middle East, which means admitting higher numbers of Christian and Yazidi refugees fleeing beheadings, drownings, and other forms of mass torture. You provide no proof for your assertions and reference no actions by the president of his administration. The actions referenced in the article without named sources began in October. I think you are the one missing the bigger picture – the history of today’s Iraq, how we and they got to this point and the cumulative performance of the Trump admin this far. Again, if Iraq Christians are so dear to Herr Drumpf why is he tweeting g about his daughter’s Nordstrom clothing line? Can you sight any example of a prior administration’s miscues? I think your Obama nostalgia has given you a touch of amnesia. Obama’s early roll out of his administration nominees was a complete disaster. Remember this list of disappointments? Below is a “Top 10” list of the Obama’s nominees and appointees who resigned in disgrace. 2. White House “Green Jobs” czar Van Jones resigned after he it was discovered he signed a statement in support of a 9/11 “Truther” group. 3. Former Sen. Tom Daschle (D-South Dakota) withdrew his nomination to become Health and Human Services Secretary after it was discovered he failed to properly pay his taxes. 4. Nancy Killefer, Obama’s nominee to serve as the government’s chief performance officer, withdrew due to tax problems. 5. Governor Bill Richardson (D-New Mexico) withdrew his nomination to become Commerce Secretary because of an ongoing investigation into whether he doled out government contracts in exchange for campaign money. 6. White House Social Secretary Desiree Rogers resigned after posing for photos at a White House dinner that a couple crashed through security to attend. 7. Jonathan Z. Cannon, nominated to serve as deputy director at the Environmental Protection Administration, withdrew over questions about a defunct non-profit, America’s Clean Water Foundation, where he served as a board member. In 2007, EPA auditors accused the non-profit of mismanaging $25 million in taxpayer funding. 8. Jide Zeitlin, Obama’s nominee to serve as U.S ambassador to the United Nations for management and reform withdrew his name while being accused of identify fraud and improper business practices. 9. Erroll Southers, Obama’s nominee to serve as director of the Travel Security Administration, withdrew after refusing to answer questions about collective bargaining and false testimony he presented to Congress. 10. Maj. Gen. Robert A. Harding, Obama’s second nominee to service as director of the Travel Security Administration, withdrew his name after it was discovered he received “service disabled veteran” status for sleep apnea. The big difference appears to be a willingness of Obama to understand the importance of avoiding the perception and reality of ethical lapses in govt leaders. Perhaps that is why his admin is noted as one of the most scandal free in recent memory. The willingness of Trump and Republicans to ignore similar or more concerning lapses and ethical issues of his nominees does not bode well. I also do not recollect serial falsehoods eminating from Obama or his spokespeople in the first three weeks of his admin. Or similar disapproval of the new president last go round. You really think that dog will hunt? I believe your list includes events that extend well after three weeks of the Obama administration, no? Anything analygous to Flynn’s Russian Flint flam or the Nordstrom tweet from Obama or alternative facts in the first three weeks? How many of Trump’s cabinet have had nanny or tax problems? Re: number 1 above: did he withdraw or resign? He could not have done both. What was it? Several of the above issues you flag occurred in late 2009 or 2010. If we were comparing the first year or 14 months these would be relevant. Again, this is a matter of perspective. The biggest blunders of the early Obama administration were the way they fumbled the nomination process for Sen. Tom Daschle (D-South Dakota) for the Health and Human Services Secretary and Governor Bill Richardson (D-New Mexico) for the Commerce Secretary. These early setbacks were a sign of the annoying incompetence of the Obama administration. They were rookie mistakes which might have been avoided by a more experienced chief executive. Nothing comparable has happened to Trump. Remember, Obama had never served as a governor or a CEO. He was, as Edward Klein noted, The Amateur. If you or your friends were ever persecuted by the IRS under the Obama administration, then you would know that his administration was not scandal free. Here’s my take on what it was like to discover errant IRS agents at work right where my wife and I live in Laguna Niguel, CA. And today continuing to lie about voter fraud nationally and in NH. The President’s senior policy advisor doubling down on the President’s lie. 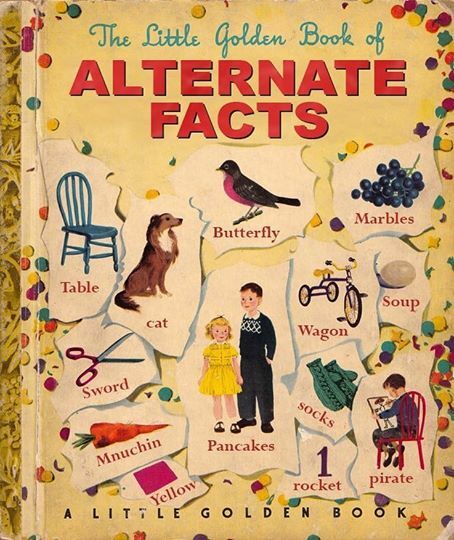 Just the daily dose of alternative facts. Nothing to get excited about if you are drinking the Kool aid. I am not following this discussion closely, but there is no doubt that there is substantial voter fraud. Now, I find Trump’s claim of 3+ million fraud votes absurd, but there is little doubt that voter fraud exists. Please do educate – and let’s not conflate voter registration with actual voter fraud. You will not the GOP governor of NH has back peddled and no refutes Miller and Trump’s assertions. And while you are at it, why not take a whack at whether Trump’s assertions regarding the murder rate in the US are remotely accurate. Perhaps you can go for the trifecta and settle whether Trump’s inauguration crowd on the mall was larger than the crowd in 2009. Humans tend to lie, cheat and steal. Politicians tend to lie, cheat and steal more. This truism is compounded by politicians who don’t have the brains with which they were born. EphBlog is powered by WordPress and delivered to you in 0.842 seconds using 39 queries..